Cancun just turned 48 years old! Discover this Caribbean paradise! The city of Cancun just turned 48 years old! This beautiful Caribbean paradise has been growing to offer the best vacation experience for all visitors. With a population of almost 800,000 people it surpasses in size US cities like Seattle, Denver and Washington, DC. When the first settlers came to create this tourist spot in the 70’s, two distinctive areas were established: downtown and the Hotel Zone. The Hotel Zone is a thing long strip of a island separating the Nichupte Lagoon and the Caribbean sea, connected to main land by two bridges on each extreme. Here is where you will find most of the night life, entertainment and some of the best high end stores. As it happens, our dental clinic is located just at 5 minutes from the entrance of the hotel zone, in one of the largest shopping malls in the city, Malecon Americas Shopping Mall. 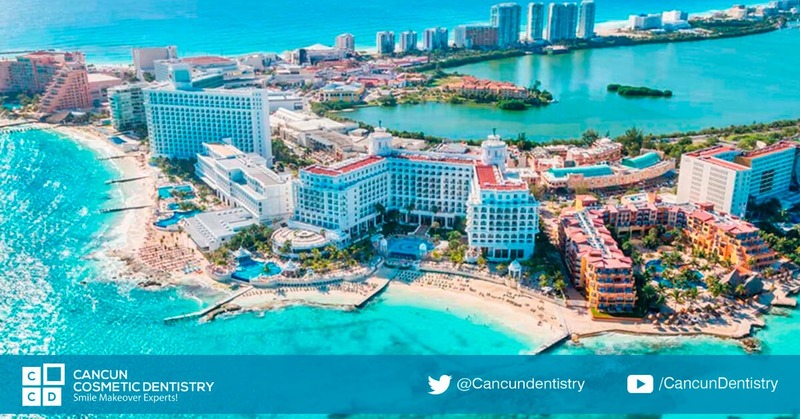 The combination of natural beauty, white sand beaches and modernity have made Cancun the crown jewel of tourism in Mexico. Cancun has received 3 million visitors a year, 300,000 which are Americans. Since the beginning, the people of Cancun care a great deal about the ecosystem. We know nature is one of our greatest treasures and the reason why thousands of people come to visit us from around the world. This is why there are plenty of protected areas not far from the city and we focus a great deal on eco-friendly activities. You will find plenty of tour options to go out on a jungle tour with zip lines, ATVs, as well as a plethora of ecological parks like Xel-ha, Xcaret, Xenxes, etc. In Cancun, you will enjoy all the modern services and the only thing you won’t find is a subway as the land in the area is not right for these types of projects. The Peninsula of Yucatan is full of cenotes and underground rivers, covered by wetlands, dense jungle and mangle protecting the coasts from natural erosion.